Pronounced “ah-sah-EE,” the superfood acai berry is both healthy and indulgent in the form of vibrant smoothie bowls. Packed with antioxidants, fiber and calcium, acai is both nutritious and versatile. One of the most popular forms of indulging this superfood, and my personal favorite, is acai bowls. Over the past few years, the smoothie bowl craze has become increasingly hard to ignore as new shops pop up nationwide — including in Atlanta. 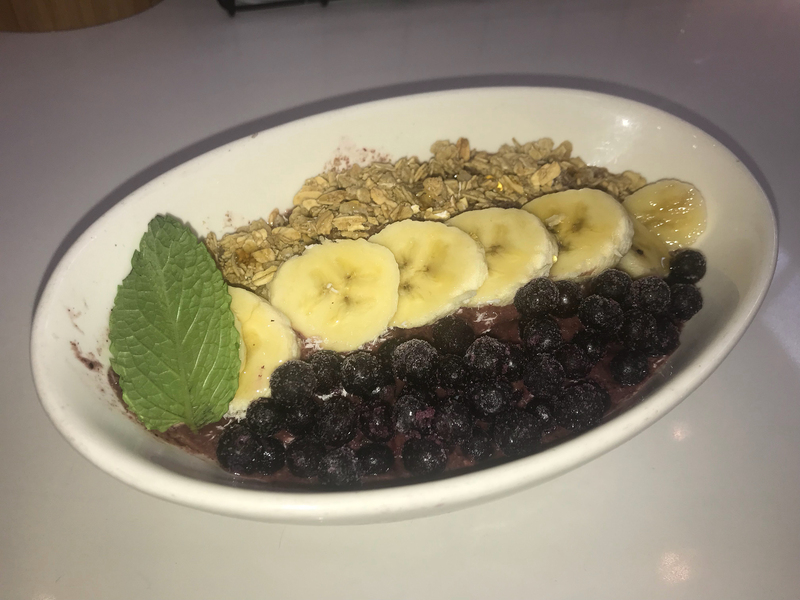 After spending my summer working at Playa Bowls, a smoothie bowl shop in New Jersey, I decided to venture off campus to seek out the superior acai bowl in the greater Emory area. I approached Lucky Lotus’ modest stand in Ponce City Market with low expectations, due to its small size and even smaller menu. The joint’s menu offers two $7 acai bowl options, and I chose the bowl topped with banana, strawberry, chocolate chips, peanut butter, granola, coconut flakes and light agave. As I waited for my bowl, I skimmed the menu and discovered to my delight that Lucky Lotus uses 100 percent organic and vegan acai. My bowl arrived a few minutes later with an aesthetically pleasing assortment of the aforementioned toppings. Though I had envisioned the bowl as a tiny dessert, I was surprised to receive a very satisfying and filling meal of 350 calories, according to the menu. The acai was sweetened by its flavorful toppings and the granola and coconut flakes added the perfect crunch. After devouring the entire bowl, I knew I’d come back for another affordable and high-quality acai treat. Next on my quest was Midtown’s Kale Me Crazy. After Lucky Lotus, I anticipated another deliciously refreshing smoothie bowl. Upon entering, I instantly fell in love with the store’s bright and modern vibe. Despite the large menu, which includes various healthy dishes, such as poke bowls, salads, juices and smoothies, Kale Me Crazy, like Lucky Lotus, offers just two acai bowl selections. Though slightly more expensive at $9.50 and $11.50 each, the establishment’s organic acai and gluten-free granola justify the prices. My smoothie arrived in a sleek, white bowl, but the blueberries on top were still noticeably frozen and proved difficult to chew. The smoothie base, albeit delicious, lacked a rich acai taste and had the runny consistency of a juice. Though the shop’s atmosphere and service created a vibrant, enjoyable experience, I would only go back to try something other than their acai bowls. Just a five-minute walk from Kale Me Crazy in Midtown lies Vitality Bowls, where customers can order from an array of smoothie bowls in different sizes. The overwhelmingly large menu features prices ranging from $8 to $12. The staff was quite friendly and helped me and my friends navigate the expansive menu, but we waited almost 20 minutes to receive our bowls. The acai base, which combines acai with almond milk, flaxseed, banana and strawberry, tasted sweet and refreshing, but closer to a smoothie. After waiting too long for the dissatisfying bowls, we left disappointed. In a boisterous area of Midtown where alluring restaurants dotted every corner, I was quite surprised that a rather large establishment with a substantial amount of items on their menu was inferior to Lucky Lotus, a mere stand with two options on the menu. Frutta Bowls, tucked in the Chastain Park Fountain Oaks shopping center, also offers customizable bowls. Created in 2016 in New Jersey, Frutta Bowls has since expanded nationwide. The store offers not just acai, but an array of bases, from kale to pitaya — and even oatmeal. As I examined my options, the cashier explained that I could add, remove or swap toppings to customize my bowl. Though it was hard to choose from the various options, I ended up ordering the “Frutella Bowl,” which consists of an organic acai base topped with Nutella, peanut butter, granola, banana, strawberry and coconut flakes. I devoured the $10 bowl while sitting on a comfortable couch and listening to the shop’s upbeat music. The perfect concoction of tangy acai with the nutty and sweet toppings made for an exceptional solution to satisfy my sweet tooth. Though it is about a 25-minute drive from campus, it is definitely worth splitting an Uber with a few friends for one of their colorful bowls. At the end of my acai adventures throughout Atlanta, my stomach was full and my mind was set: I can confidently claim that Frutta Bowls offers the best value for its delicious array of healthy smoothie bowls and its spacious and upbeat setting — perfect for hanging out or for a relaxing break off campus while enjoying a satisfying, nutritious treat.